This is the first in an occasional new feature, where I'm going to 'stalk' a book around some blogs! Hope you all like it. 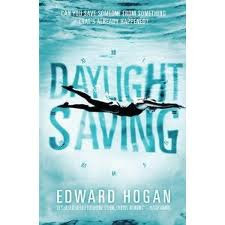 My first choice is Daylight Saving by Edward Hogan. Back in January, Undercover Reads showcased the super atmospheric trailer video. Melanie at Books are Vital helped to spread the word about Daylight Saving by featuring it on Waiting on Wednesday, saying "But this, this! you people, sounds amazing." as did District YA, the Traveling Reader and YA Book Queen. Onto the reviews, then. Juxtabook described it as "so very, very good I'm going to sound like the author's mother." Serendipity Reviews said "When I imagine how I would like a ghost story to be, then this is how I envisage it... Daylight Saving is the type of book I would imagine Susan Hill writing if she were now debuting as a YA author." Sister Spooky, giving it 7.5/10, said about the main character's reluctance to get involved at Leisure World "Having had more than my fair share of awkward family holidays (oddly one at Centre Parcs) I know exactly how Daniel feels." My own review was another really positive one, praising the way Hogan kept things "tense and fantastically atmospheric right the way through this novel." Writer-On-Wheels praised Hogan for the "outstanding plot" but warned that "this isn't a book for younger, or quite sensitive readers" due to it being "very emotional, and very scary". Sarah over at Feeling Fictional gave the book 4/5, and made a really perceptive comment about the location, saying "The setting is like an extra character in the story and nothing about it is quite what it first seems, instead of being a family friendly location it has quite a sinister feel to it." Of course, once an author's finished writing a book, rather than put their feet up, they often get people like me begging them for interviews. Ed was kind enough to speak to me right here on YA Yeah Yeah, and there's another fabulous Q & A with him at The Review Diaries. As well as these interviews, Ed gave Vivienne from Serendipity Reviews a list of books that inspired him, to kick off her new 'Inspire Me' feature. I loved this one, and will look forward to reading more of this brilliant feature idea in the future. Sarah at Feeling Fictional is running a giveaway for a copy of the book! It's UK only and there are about 2 weeks left to enter - closing date 3rd March at 12:01 am. Good luck if you give it a go! If you'd like to talk to Ed, he's very approachable and can be found on Twitter at @edhoganderby. Have I missed anything out here? If there's another Daylight Saving blog post I haven't covered, please let me know in the comments so I can edit it in! Would also be really interested to hear whether you think this is a good feature idea.